Tagged under Toshihiro Kawamoto, Sunrise (Studio), Series. In the semi-distant future, bounty hunters have become a major reality. 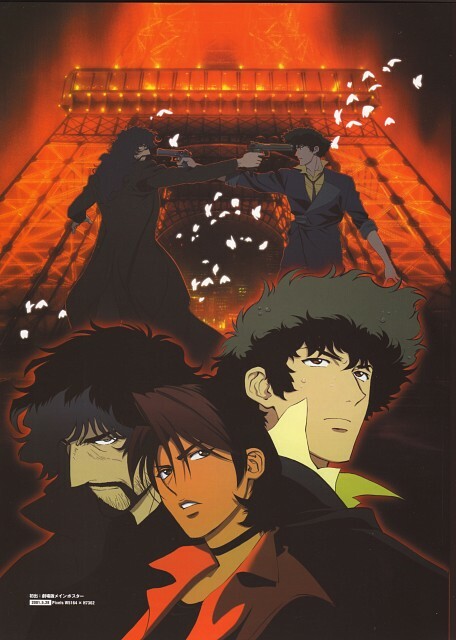 Cowboy Bebop follows the crazy antics of two bounty hunters named Spike Spiegel and Jet Black. Throughout the anime they come across many odd faces of bounties and even some friends. By the middle of the series, the Bebop - the ship Jet owns as an HQ for his team - is filled not only with Jet and Spike, but Faye Valentine, a beautifully dangerous bounty hunter, and Ed, a crazy 9-year-old tomboy master hacker. Throughout the 26 episodes and one movie (that takes place between episodes 24 and 25) the Bebop crew go through many bounties and crazy adventures just to scrounge around for some type of income to keep them alive. Bebop is an anime for the people who love comedy mixed with great action and drama. Overall, I consider this as not only my personal favorite animated series, but as a masterpiece. All of the ingredients that are necessary in order to make a successful overall presentation are present in skillfully meted amounts. Sadly, I doubt that we will ever see a remake or a continuation of Cowboy BeBop, as it is very unlikely that the proper mix could ever again be realized, yet, I would not mind being mistaken in that assessment. I recommend this anime to those of you who love adventure and anime. Known as one of the greatest anime ever, I'm not entirely sure if it completely lives up to it's title, but I can definitely say that it is one of the most consistently good shows I've watched. It's impossible for me to pick my favorite episode of this show, because they are all so good. Who hasn't heard of this show, right? All I can say is that it is an excellent anime. It has a great balance of humor and drama, and Spike is just an awesome main character. If you haven't seen this anime yet, watch it now! You are seriously missing out because it is one of the greatest anime series of all time. I loved this particular series by Sunrise, a perfect blend of an awesome story, great cast, Yoko Kanno's music, and compelling characters make this series a wonderful masterpiece. The main characters drive the story through their relationships with one another and how their personal lives become intertwined. It is sad when some people dislike this series because of it not having a serialized plot and calling it overrated because of superficial and biased reasons. Cowboy Bebop is a series that is soulful and shows what is means to be human, it will be a series I will always love. Oh my God... This show was one of the best, not just in anime, shows I have ever seen. I enjoyed every single character and the stories behind each of them. My favorite character of all time (still is) is Spike Spiegel who may be the most badass character ever to be drawn on a paper. His lifestyle, back story and personality are literally the definition of cool. His crew members Jet Black, Faye Valentine and Radical Edward each have unique stories that are fitting and complementing of each other. The story of this show meshes together all the characters and immerses you in a fantastic universe of space travel and everyday life of what bounty hunters might be like in the future. I believe it is truly deserving of its place as one of the greatest animes of all time. This is a series that you can watch again and again. Each sub-story/session has it's own kind of charm to it. More character history for Jett, Faye, and Spike would be nice, but there is enough in the anime to move it along. This was one of the best shows that I have seen. Not only was the animation great, but the music and setting blended very well with the story line and the way the charecters were, hard to choose who my favorite charecter would be, but at the end of the day it was one anime show that everyone should have seen or deff watch. Although I don't like space series, Cowboy Bebop catched my attention. How? Due the funny jokes on the right moments and a beautiful representation of the Earth's future if we continue like we are. The characters are just the cliche ever, the protagonist and his mates, trying to fulfill their dreams. Something like that. One of those anime that I viewed in the early 2000's, yet I've never forgotten it. The characters are wonderfully fleshed out, the animation is fluid and timeless, the plot is engrossing, and the soundtrack- beautiful! One of the most memorable music moments was during episode 5, when Vicious first appeared and confronted Spike in the church. The second the song "Green Bird" starts playing it's like ear-magic, without Hogwarts. One of the best things about Cowboy Bebop is the focus on the characters; they are three-dimensional, fascinating, and each have a mystery attached to them that unravels as the series gracefully goes along. This is not an anime to be missed! This series is mature yet playful and a whole lot of creativity to boot. The characters are mysterious, the plot is believable and very badass sc-fi. I will say that the Movie was not very good, the series is much better. Between all of the main crew I'd say I like Ed and Ein the most, but who doesn't! Each episode was either extremely entertaining adventures, or a in-depth dip into one of the characters' lives. This is a classic that should be seen by every anime fan at least once through. Insanely awesome! One of the best anime of all time! Fantastic and unique story filled with very well developed and unforgettable characters and a well made space/futuristic setting. This is a must watch for any anime fan that has had the misfortune of not watching this yet. I absolutely love this anime, from characters to the plot. To be honest, I also sensed something unpleasant when I saw the title, but since I got nothing better to at that time, I decided to try the first episode, and oh, it was great. Whenever someone asks me about Cowboy Bebop, all I have to tell them is that it's a cultural phenomenon. It takes place in the future where humanity has extended its reach to all the planets in the solar system. Bounty hunting is the law of this new frontier. The story centralizes around four people onboard a ship called the Bebop. Each one has a life to sort out and each one deals with it in their own way. The plot doesn't feel very intricate, but the anime has a lot to be proud of. It has beautiful themes and a musical score that sets it apart from all others. Love, love, love this series! Love the ending song and have "Blue" as ringtone in my mobile. Used to have Lain opening as my ringtone before this one. I own the manga, but I really didn't like it so much because it was based on the anime... I feel like it's more like doujinshi since it wasn't the original author who did it. I own also the "Knocking on heaven's door" movie in DVD.